Welcome to HOUNSFIELD, Jefferson County, New York! Welcome! This site was last updated on 2 June 2012. It is intended to be a central location for learning about all things Hounsfield, from its early history to the present. If you would like to contribute to this site please contact the coordinator. Sorry, but the coordinator cannot perform research—please use the "Connections" page instead. Enjoy! 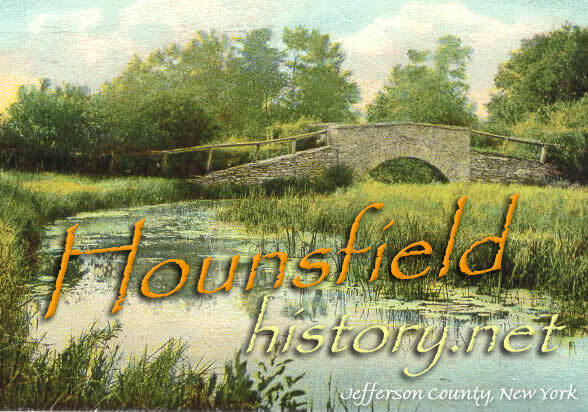 What's new. . . .
© Mark A. Wentling, 2000-2008 This site was created 24 January 2000 in order to promote awareness of the historical richness of the Town of Hounsfield, Jefferson County, New York. You are the 32613th visitor since this site was redesigned in 2005 (on top of more than 14,000 since our beginning in 2000!)! The webmaster can be contacted at hounsfield@hotmail.com, or visit his website LEGENDS which documents many Jefferson County families. This nonprofit research site is a USGenNet CertifiedSafe-Site™ and affiliate of the American Local History Network, Inc. (ALHN). Web hosting is generously provided by USGenNet, a nonprofit, tax-exempt public benefit corporation. This site makes no claim to the copyrights of individual submitters, and is in full compliance with USGenNet's Conditions of Use.